Snacks Consumed: Water. But I just had Jenni’s amazing lentil loaf for lunch, thanks. 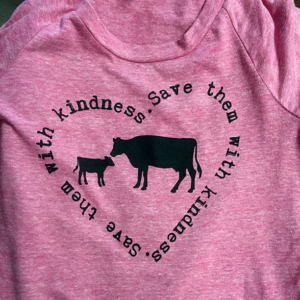 We love printing for Renee’s vegan apparel line. She always chooses the best shirts, which may have something to do with her fashion industry background. When she originally approached us about printing her apparel, she grilled us about our processes: Are the inks we use vegan? Is our process enviro-friendly? These things were extremely important to her and equally important to us (answers: yes and yes). Threads for Love is on a mission to spread compassion for all animals through vegan and eco-friendly designs. 10% of every sale is donated to various animal welfare organizations. Go check out the tees! Filed Under: Inside the Shop, Screen Printing, Vegan, We printed this! ← Get crafty. Decorate your own t-shirts for supreme holiday merriment.